Home » Reviews » Elvis 80: Blend is like coffee and cream! Collaborations, many times, do not bear fruits as desired but in certain cases, things fall rightly into place and wonders are born. One such example is Hamilton Ventura. Superlatives like innovative and iconic have become too commonplace; let’s just call this Hamilton piece a plain and different; good, entry-level watch that’s capable of giving many of the so-called authentic Swiss-made watches a run for their money. 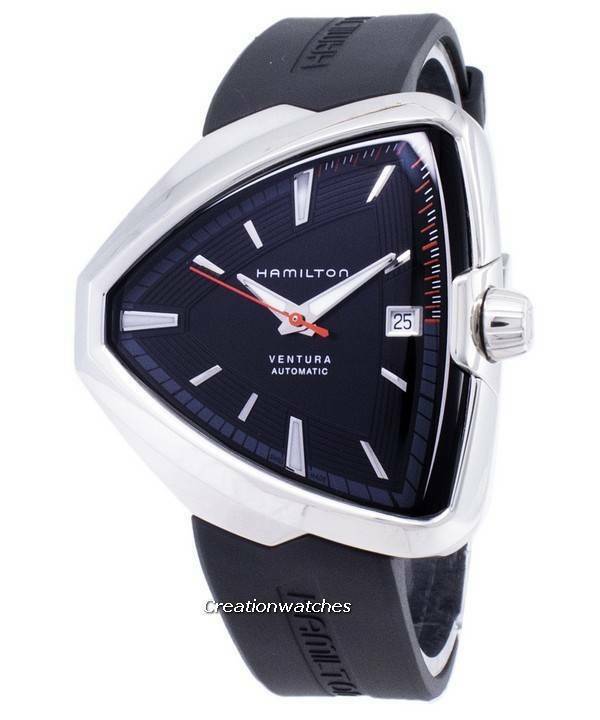 This coming together of American Spirit and Swiss Precision – the way Hamilton portrays itself – didn’t just bore some excellent dress watches; Hamilton’s inclination to the intrinsic and eccentric sides of luxury also brought forth the Ventura Elvis 80, which is unlike any other watch you get today. The roots; however, go back pretty far, to the end of the middle of the last century. That was the original Ventura! It made its ground being the first electrical – not quartz – battery powered watch. Later on, as Hamilton further honed their designing and technical skills, they introduced automatic versions of the same. Not that they couldn’t do it earlier, but the Ventura was planned to be electrical. The inclusion of automatic calibers was a modification on the actual Ventura concept. That’s typical of Hamilton. Digging up connections and making something substantial out of it. Ventura’s biggest fan had been Elvis himself and this H-10 caliber movement with 80 hours juice in its mainspring is in his honor, on his 80th birthday. Ventura is charming also in another way. It was meant to be a watch with complete disregard towards practicality. This triggered an instant sensation which now continues over six decades. It’s no surprise why Elvis chose it either! The inevitable King of Rock’n Roll was an ultimate rule-breaker; the Ventura was the rule breaking step from Hamilton! He fused country with R’n’B alright; even Ventura doesn’t come out to be anything less in fusing intricate – sometimes traditional – designs with precision. Plain and simple in its functions, the three-handed H-10 Caliber is etched with contrasting, intricate snail and pearled patterns and streamlined surfaces. The ‘against’ mindset is so firmly ingrained in it, starting from its asymmetric triangular case. It breaks the normal mould of round or square; rectangle and other conventional forms startlingly, enough to stop people draw any sort of comparison. Ventura is a class in its own. 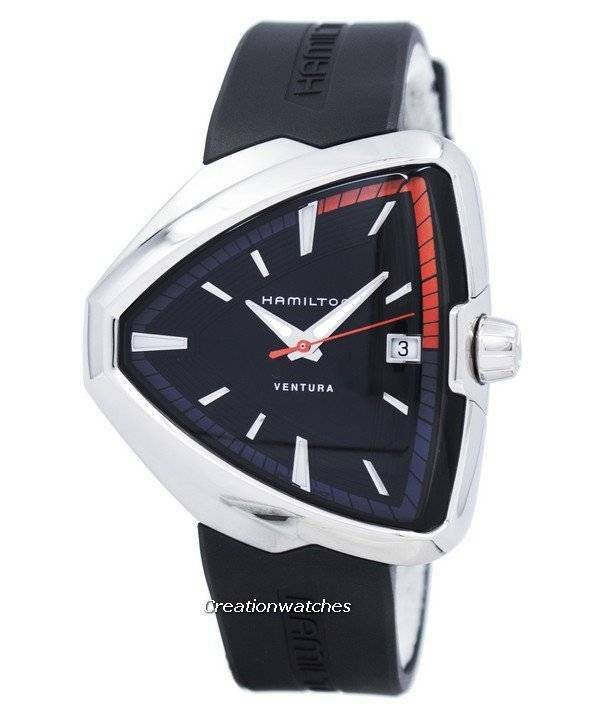 The Hamilton H-10 movement running it has a power reserve of 80 hours. It turns out to be a real boon to watch-rotators. The performance of the complication is as good as Hamilton’s reputation within this bracket. The 150-odd-feet of water resistance, a very high legibility, a large, steeply-sloped sapphire crystal with anti-reflective coats win hearts easily. The Elvis 80 has an interesting crown. It has sloped sides which appears to be nothing more than a stylistic choice, but this is a BIG watch and the conical shape makes wrist-movements a lot more comfortable than straight-sided crowns. You can wear it as much as you like. Nothing of that sort of a jabbing feeling! Newsletter : New Year’s Sale on Watches – Discount Coupon Inside!! Newsletter : Casio Edifice Chronograp​h Watches on Sale! Newsletter : Seiko Monster 200m Divers Automatic Watches on Sale!